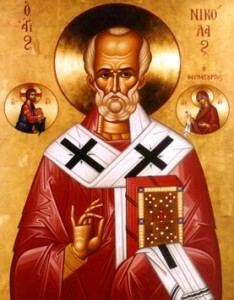 St. Nicholas is remembered and revered among Catholic and Orthodox Christians. He is also honored by the Anglican, Lutheran, and many, many, other churches. Nicholas was born in Patara of Lycia during the third century, of devout and wealthy parents who provided him with a Christian upbringing and education. He was orphaned at an early age. He probably became a monk, and when the bishop of his district died, he was made Bishop of Myra of Lycia. Nicholas is distinguished for his faith, especially for his charity. His faith was so great, that with his prayer he calmed a stormy sea while on a trip to the Holy Lands. It is for this reason sailors pay homage to him as their protector. He fought for the predominance of Orthodoxy and took part in the First Ecumenical Council of Nicea. Especially well-known is his charity and love for children, he used his great wealth to relieve all who were in need: families, widows, orphans, and children. For this same purpose he founded, as Bishop, a poorhouse, hostelries, and a hospital. He was the personification of Christian love and affection. As such he is honored by the entire Christian world, both the Eastern and Western Churches. In the West especially he is considered as the great patron Saint of children and in modern times as the cheerful giver of gifts, Santa. Widely celebrated in Europe, St. Nicholas’ feast day, December 6th keeps alive the stories of his goodness and generosity. In Germany and Poland, boys dressed as bishops begging alms for the poor andÂ sometimes for themselves! In the Netherlands and Belgium, St. Nicholas arrives on a steamship from Spain to ride a white horse on his gift-giving rounds. December 6th is still the main day for gift giving and merrymaking in much of Europe. For example, in the Netherlands he is celebrated on the 5th, the eve of his feast day by sharing candies thrown in the door, chocolate initial letters, gifts, and riddles. Dutch children leave carrots and hay in their shoes for the Saint’s horse, hoping St. Nicholas will exchange them for small gifts. Simple gift giving in early Advent helps preserve a Christmas Day focus on the Christ Child. â€“ Information from St. Nicholas Center.